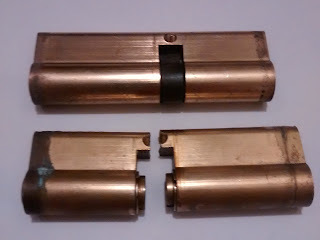 Lockforce Emergency Locksmiths News: Why risk your family and possessions with cheap locks and bad security? Why risk your family and possessions with cheap locks and bad security? Between April 2017 and March 2018, Manchester had almost 30,000 burglaries, which I find just staggering and shows crime seems to be forever on the rise. Fortunately many of us have not experienced a break in and hopefully never will but why take the chance, safeguard against it for the future and prevent being a number in next years statistics. Here at Lockforce Locksmiths we take security extremely seriously and are here to help educate and protect you. We only provide British Standard (insurance approved), anti snap locks for all your UPVC doors. You would be surprised at how easy the common lock is to snap for criminals, taking them no more than 20 seconds to gain entry to your home, (don't believe us...? Just google lock snapping on you tube). Above is a picture of a common Euro cylinder found in most UPVC doors and you can see how it was snapped in half to gain entry.